learned and been assured of"
As in rest of our ministry, the goal of TeachingtheWord's Resource Store is Equipping the Scripture-Driven Church. Much of what you'll find in many other online religious bookstores is simply un-Biblical, and therefore harmful to God's people. But you won't find the latest fad religious books here. Everything in our Resource Store is solidly rooted in Scripture. Why is this so important to us, and to you? Because the Bible is the only supernatural book. It is the Christian's sole source of authority. Nothing else comes close, because nothing else is the inspired, inerrant, infallible Word of God. 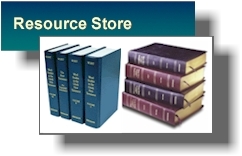 Therefore, we focus on providing two kinds of resources: faithful translations of the Scriptures themselves, and publications that are faithful to the Scriptures ─ tools to help you understand the Bible better, love it more, and live by it more faithfully, written by men of God committed to the unique authority of the Word.